What Is the Practice of Medicine like in Russia? Before you begin working your way to foreign language fluency, it helps to understand the culture behind the language you’re learning. After all, language exists to help a group of people express their ideas and beliefs. Russia is a vast country with a rich history and culture. As you begin your Russian language program, gaining a strong grasp on this history, the values, and the etiquette will help you rapidly achieve success. In particular, Russians may have universal health care, but they also prioritize being fit and take the proper precautions to stay healthy. Russians might look like people that keep everything to themselves at first glance, but the fact of the matter is that they are more than willing to have conversations about almost anything with almost anybody. These conversations include talking about any physical ailments they might be suffering from. There are long standing stories about customs officers wanting to talk about her headaches with her colleagues as she is checking people through. There are also plenty of stories about people making sure they aren’t getting sick and taking that to a level that gets a bit silly after a while. Secretaries will start bringing in homemade remedies for their bosses if they hear someone cough or sniffle on the bus home the night before. Coworkers will stay home with a hangover because they believe it might be something worse and they don’t want to give it to anyone else. In order to stay healthy in Russia, you are going to want to make sure you are dressing appropriately. This means that you are going to want to dress appropriately at all times. Even in the summer, Russia isn’t exactly a tropical paradise, though you will be able to dress like it’s a bit warmer than you would if you happened to go there in the middle of the winter. If you are indeed heading outside in the dead of winter, you are going to want to make sure you are dressing warmer than you might even expect. Even in the middle of Moscow, the temperatures can drop quite quickly and to levels you might not expect if you are coming from the United States. The Northern part of Russia is quite a bit colder than even what you find in Montana or North Dakota, or Minnesota. Underneath the warm winter clothes, you are going to want to look your best. If you are in Russia in order to do some business, make sure you are wearing a conservative suit. Russians tend to judge a person by what they are wearing before they even really get to speak to the person. If you are dressing incorrectly whether you are heading outside, or heading to a meeting, you are going to be making a mark on the Russians. If you want to be taken seriously, dress for success. A “sense of humor” in your business attire is not funny to the average Russian. Since 1996, the citizens of Russia have received free healthcare per their constitution. But due to the financial calamity that has been ongoing since 2014, the results have warranted major cuts related to spending and quality of service. Close to 40 percent of medical centers have inadequate numbers of staff to provide care to patients. Others have had no other option than to shut down the facilities all together. Treatment waiting times have also increased and patients are paying more out-of-pocket expenses. Russia has tried to make progress in regards to health care reform. But to date, many practices related to it are still the same and date back to those from the Soviet era. Polyclinics offer both specialized and general exams. Independent from hospital treatments, they provide service to a major geographic region. As the primary core of the health care system, they house separate centers for those who are under the age of sixteen. Russia has a significant number of doctors and hospitals. But the health care crisis still continues in spite of the numbers. They also have some of the most extensive hospital stays worldwide. This may even be one of the reasons the health care system is diminishing in Russia as it lacks the proper funding for research and state-of-the-art equipment. Although the health care system in Russia still looks bleak to date, resolutions are being looked into to rectify the crisis. While there are many reasons to visit Russia, good healthcare is not one of them. The country’s health-care sector has long been known to be overstretched and underfunded. Their health care is an interesting mix of NHS-type doctor’s offices, hospitals and clinics, and some private insurance centers. 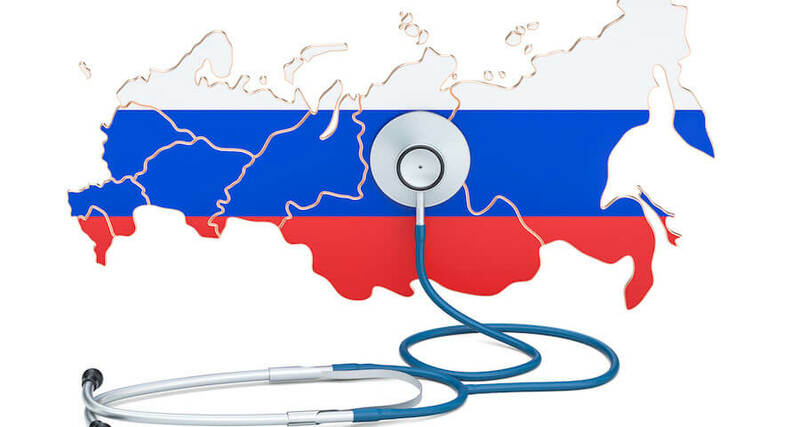 The good news is that if you are in trouble and need medical attention in Russia, the doctors are known for showing a level of compassion that will get you treated even if you don’t have the money to pay right away. At the same time, because the healthcare industry is so poor in Russia, you have the real possibility of not really getting treated at all. You may run into a doctor who does not care about your health and just wants to move you along. There are plenty of stories in which a doctor will diagnose you with the correct malady, but barely even treat the problem. One story tells of a banker who was given generic painkillers to treat a bacterial infection in his stomach as well as bronchitis. Not feeling better after a week or more, the banker returned to the United States and headed to a doctor. The doctor told him he had the same malady that the Russian doctor had reported to him, but the “medicine” he was given had not done anything to fight either of the health problems the man went to the doctor to treat.